I’ve known you guys for a little over three years now. I think it’s finally time to introduce you to my secret shame. BAM! That’s the overgrown landscaping in the front of my house. It was originally installed by the builder, and I swear that they just randomly put in whatever was on sale at the nursery that day. It was just plain ugly. And then on top of the randomness, a morning glory started growing and completely overtook a bi-color iris. Once a week, I’d try to pull this thing out by its root, and each week it would come back even more powerful. I’m pretty sure that this one vine could have taken over the entire world if I would have let it. For all of our DIY prowess, my husband and I hate working in the yard. It’s hot! And there’s dirt. And one time I saw a spider with a sack of eggs on her back, and it sent me over the edge. So, our landscape overtook our front beds like a wild kingdom. Last summer, we decided that enough was enough. We had a landscaper pull out of the plants in our beds, till the soil (which is clay, by the way) and add in some landscape fill. If you might remember, we were in a mega drought last summer, and he advised that we not replace the plants until we started getting some rain again. Fast forward to last month (yes, we left the beds completely empty for about 9 months). I started doing tons of research online and in different books dedicated to landscaping in our region. I measured the beds and made a plan of exactly what types of plants I wanted to put in what location. And then, I started digging and planting. Do you spy my dog? Over the course of two weeks, I visited local nuseries five different times. I wanted to only buy a few plants at a time so that I didn’t overwhelm myself by trying to do it all in one day. I started off by putting in the two sky pencil trees that flank the front window. 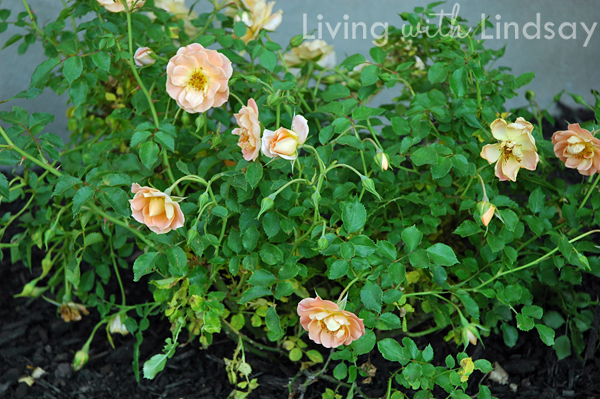 Then came the three Oso Easy Peachy Cream rose bushes under the window. I added a dwarf mock orange, three drawf yaupon hollys, and a stalked bulbine frutescens. Look at me throwing these names about! Am I fooling you into thinking that I know what I’m talking about? 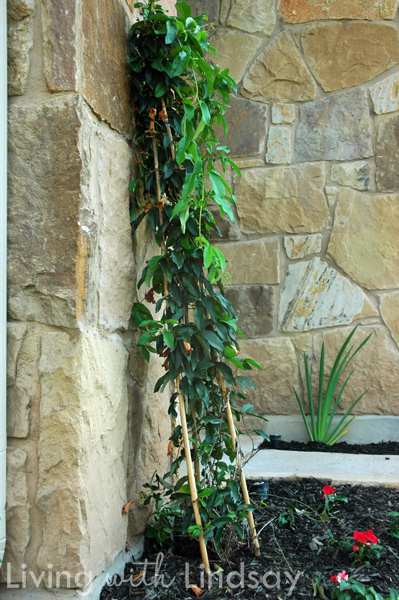 On each side of the column on the front of our house, I planted a crossvine. I am absolutely obsessed with these vines! I’ve seen them growing sporadically on the stone fence that surrounds a nearby neighborhood, and I am just so in love with them. In March, they are covered with gorgeous, trumpet-shaped tangerine blooms. The rest of the year, they are hardy and semi-evergreen. In the long part of the bed, I snaked an array of dwarf mock orange shrubs. I used the curves in the snake to showcase groupings of annual color, which are zinnias (orange, yellow and white) and impatients (red). I love the mix of the lighter shades of the blooms on my perennials combined with the hot shades in my annuals. In the mini bed in between our sidewalk and wall to the garage, I put in four Louisiana Irises, two Wonder Flowers, a dwarf mock orange and another crossvine under my Texas Star obelisk. I’m really not sure how those irises are going to do, but I thought I’d give them a shot. I also found what may be my favorite plant EVER to put in a pot by my front door. 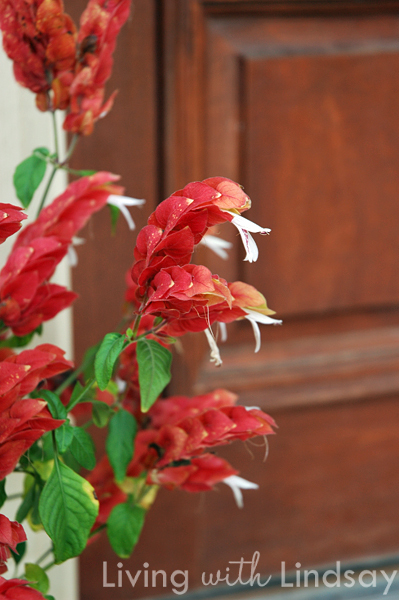 It’s called a shrimp plant. Doesn’t its blooms look just like shrimp? I’m proud to announce that I survived the dirt and didn’t see a single spider while I was putting in tons of plants. I did, however, see tons of earthworms, which is awesome (as I understand it). I’m really excited to see how this landscape design grows in over the next few years. I am now doing whatever I can to keep these plants alive. I’m watering them every morning, and when they are well established, I’ll switch to three times a week. I’ve fed them and marked on my calendar when it’s time to feed them again. I’ve mulched them and am pulling any weeks that poke through. Now, I need your advice! I would reckon that 99% of you know more about gardening and maintaining beds than I do. Do you have any more tips for me or suggestions on other things I should be doing? And please don’t let that answer be that I shouldn’t have planted a certain species. That will make me cry! Thanks, Marty! When the mock oranges are in bloom, it is a scent better than honeysuckle. Delicious! 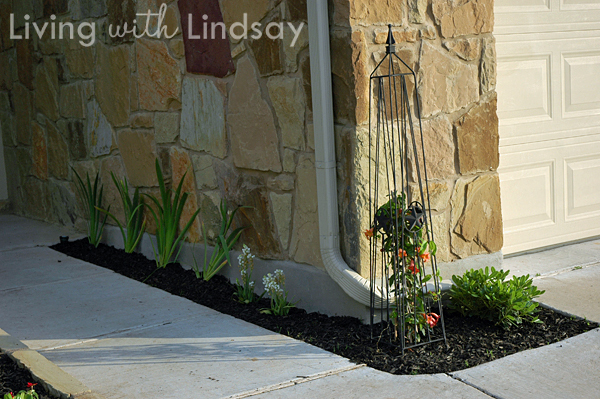 Lindsay- something that is a great filler and will lend some softness to the hardscape ( your pathway) is some Liriope or more commonly known as monkey grass. In the early summer it will produce purple flowers. It is drought and heat tolerant. It’s a fast spreader so over time you will need to divide and pull it out and transplant to other areas or it will cover the entire area. Thanks, Laura! I need to look into that. The builder actually installed some monkey grass there, but it never grew. It looked so sad! But, now that we have better soil, maybe that will help. Thanks for the suggestion! maybe it’s the angle but it doesn’t look that bad. The before is nothing to be ashame of. It could have been worse.. like it could have been all weeds and thorn bushes that prick you as you walk by. Oh, it had tons of weeds. LOL No pricking bushes, though, so score one for the home team on that! It looks fabulous! The only thing I would have done differently…and there’s still time…is to plant the little trees farther away from your foundation. they will be bigger trees one day and that close could be a problem. Okay, that’s a good suggestion. Maybe you can help me with that? They are probably about a foot away from the foundation. I want to keep them smallish, so only going to the top of the window. If I keep them trimmed like that on the top, do you know if the root will spread wider in the ground. I know most trees have the same size root as they do limbs, but does pruning it make the root stay smaller? And yes, I’m sure that was the dumbest question that could have ever been asked. Amazing! I know spring is in the air, I painted our trim on Saturday and seeing your pretty yard makes me want to plant some flowers. You did a great job! I don’t know a thing. In our last house we were replanting every season because we could not keep a single plant alive. I think the problem is I share your hatred of yard work- so once a plant goes into the ground I turn my back on it and expect it to thrive on only the care that mother nature provides it. It sounds like you’re doing a waaay better job with your plants than I do with mine! And your yard looks beautiful! It really should just do all of the work itself. Someone needs to invent a plant that will do that. Oooh, such great advice! Thanks, Lisa! Your beds look lovely! The trees look a bit close to the house so I hope it is just due to the picture angle. I recommend installing some drip irrigation. The watering is done for you and at the roots which makes for healthier plants. Thanks, Kelsey! Fingers crossed that these plants get to continue living! I’ve been reading in Google and haven’t been over in a while. I love the header! No advice about plants. You should see my yard. No, you shouldn’t really. It’s beautiful!! Have to say it was pretty nice before as well. I guess I need to spruce up my landscape as well. I love flowers and have irrigation but they are so costly. I try to do a little more each year. When we moved into our home it was a spec house and had NOTHING!! Oh, that’s a bummer! I speak from experience that it isn’t cheap to put everything in! I saved up money for a while so that I could do what I needed to do. Lindsay–as for the trees, you can actually trim the root ball a bit before you plant them–or move them. 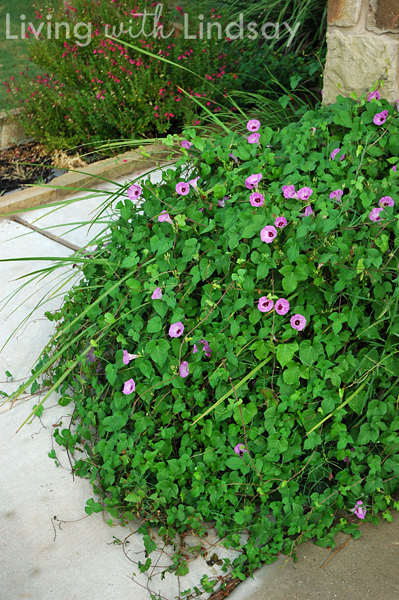 I’d keep them at least two feet away from the foundation, even if you plan on keeping them pruned. Add compost to your soil at least once a year and you’ll enrich the soil and probably won’t even have to feed. 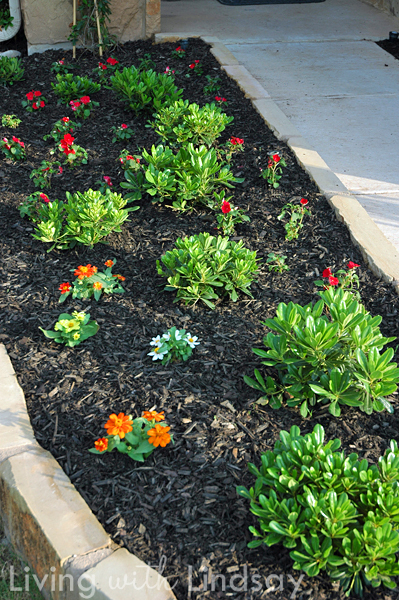 work compost into new beds before you plant…works wonders. Thanks! I’ll dig up those guys and move them out so more. Thanks for saving my foundation! Mulch, mulch, mulch! 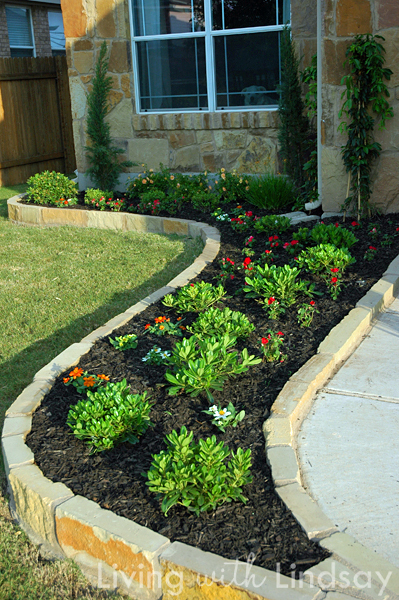 Use a good hardwood mulch and it will make your life (and plants) so much better! Yes! I did add some good mulch. Really awesome flowers, they look great. Nice work! I’ve only pulled out some stuff in my landscaping and have yet to replace and rework it. I guess I am in a similar boat as you regarding enjoying landscaping. We are in the northern climate of ND and I use Preen for weed prevention in my landscaping. It is a pre-emergent which means that it will not kill the weeds currently growing but will prevent the seeds from growing. In our area I only have to apply it in the spring and it pretty much lasts until fall but the directions do say how often it should be reapplied. Oooh, I need to look into that. Thanks! Too funny! Still laughing at the spider with the eggs on its back- ughh! You’ve done a marvelous job. Just enjoy. Everything DH and I plant ends up being ‘gigantic.’ That’s not something you want if you needed it to be ‘dwarf.’ Okay, one suggestion: The cutest little tree imaginable is the Redbud (sweetheart shaped leaves and the prettiest-petticaoat pink blossoms in Spring). The Redbud is carefree and perfect for the shady shide of the house. It only gets fifteen feet tall (max) and looks divine with creeping phlox underneath. Yes, earthworms are good. Oh, Redbuds are my favorite trees ever! They are native here and just make me giddy every Spring. I need to put one in somewhere in the yard. Thanks for that suggestion! Hey Lindsay, your yard looks great! 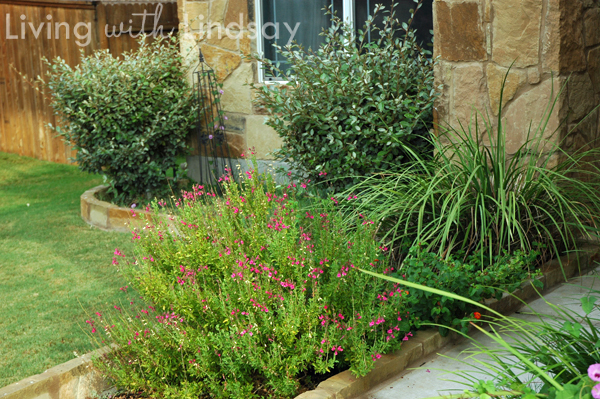 I noticed your Texas star and the type of plants… Do you live in Texas too? I am always looking for fellow Texas blogger gals to be buddies with. I am going to check into some of those plants. We are in a new home now and I have a ton of landscaping to do. Just came across this landscaping post. I’m in the Austin area and I have an eye sore that’s very similar to your before. Actually, the exterior of my home looks like a twin to yours. What landscaping company did you use? Hi Conessa – I actually did all of the plantings myself. I did use Landscaping Express to remove the old plants and to bring in some dillo dirt. We’ve used them on several projects at this house and at our old house, and they do a great job. Juan is the owner there and his number is 512-563-5467. He used to have a website, but I can’t find it this morning. I hope that helps!